Considering we spent the night on a Rest Area site on a busy toll road, I for one slept very well. The Chef heard a few vehicle movements during the night, but me, nothing. It was a nice sunny morning, and although it was cool during the night it certainly wasn't as cold as it had been the past couple of mornings. I did get up about forty-five minutes before we were due up, just to turn the hot water and heating on. We weren't going to bother with showers, just good washes as we would be at a campsite later with all facilities. Before setting off I wanted to check the vehicle tyre pressures. I hadn't done it for a month, and although they are seldom out, there's no room for complacency. In the end we didn't get away too early, never mind we didn't have far to go. We had one nasty surprise - the W05 motorway which would take us all the way to Bordeaux, a distance of about one hundred miles, was now a toll road. So that nice Frenchman 'Jacque the TAG' will be taking even more money out of our bank account at the middle of next month. The traffic around Bordeaux was horrendous, thank heavens the satnav didn't decide to take us through the city centre today, something it is prone to doing on a 'bad hair' day. 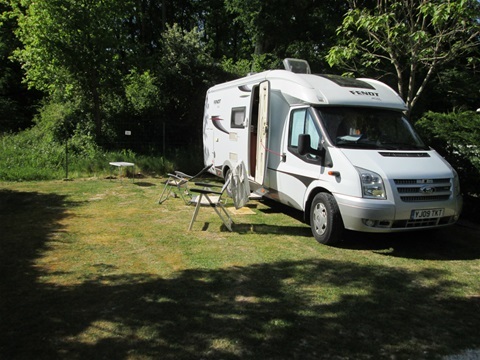 We are at Camping Bel-Air www.campingbel-air.com just outside Créon southeast of Bordeaux. Of course they don't tell you such things in the campsite books, but there is just one bus in to Bordeaux each day. It passes by outside at 12:54 and returns at 18:15, so we'll be looking to try and knock off Bordeaux Old Town etc tomorrow afternoon. If the weather is good enough on Monday we'll stay here for a day of relaxation, if not then we'll be off down the road about twenty-five miles to St Emilion, where they just happen to produce rather nice wine. As for the weather today it has been glorious, what a difference a day makes. I think the very cold windy weather we have been experiencing was due to our altitude up in the Sierra's. Whatever the reason, it has suddenly made us appreciate a nice hot sunny day, something we had just taken for granted up until then.